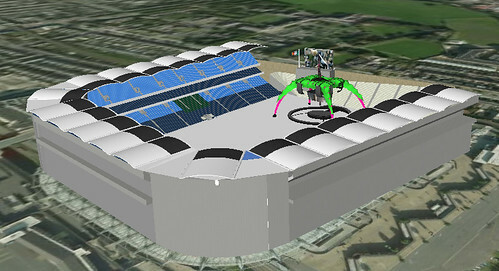 U2360 tour architect Mark Fisher & his team at Stufish have come up with a 3d model of all three U2360 stages (Red, Green and Blue), which will be placed in all stadiums the band are playing in this tour (in Google Earth that is…). Check this site to see if your stage is already built and if you get to see the green, red or blue ‘steel’. Cool sequence of webcam pictures of the stadium in Gelsenkirchen, Germany where U2 are playing on August 3.